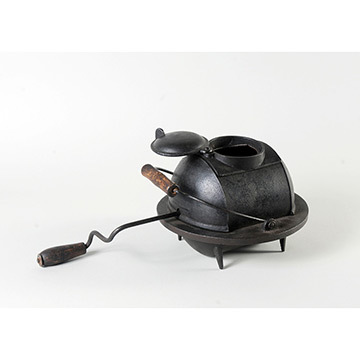 This cast-iron roaster could have been used in a hearth standing on its four legs in hot embers, or suspended by its collar in the eight-inch burner hole of a cookstove. The round cap swung open to accept coffee beans or spices. The hand crank turned two blades inside—one narrow blade agitated the contents to keep them from burning, and a wider, curved blade scraped the rounded floor of the container. A pin on its underside released the bowl from the collar for emptying or cleaning.